Costa Cruises has anounced that their 1991 built 53,015 grt cruise ship ' Costa neoClassica ' has been sold and will leave their fleet in March 2018. The ship had been advertised for sale at about US $ 150,000,000 but the sale price is not known nor who are her new owners. Pictures show the ship and her theater. Do you have any guess who bought the ship or where you think it may go? She is finishing off with a series of cruises from Mumbai before being withdrawn. I use a trade website which tells me the owners, inspection details, and survey details with expirey dates for various certificates so when that changes I will know. With the new classic flag ship for CMV, the ' Columbus ', it did not change until she had arrived in the Damen Drydock at Amsterdam and had been there about ten days so will be monitoring this website for details of her new owners but it could be into next year before it appears on this website ! I do know it was said at the naming event for the ' Columbus ' that her Greek owners are looking for more ships but I have had a look at their advance cruise sailing lists and nothing there at present so only other source could be the lists of cruise ships calling at ports and a new ship appears, with a name that is not recognized, which if it is in the far east areas it may not be so easy to find in advance. and rapport with others and to spread virtue among peoples; all peoples. Thanks for your reply; it is always good to hear from you. 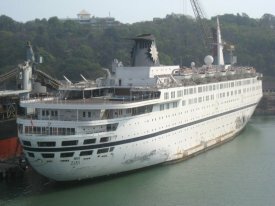 There has been talk of a new cruise service from India around the Indian Ocean and also Sri Lanka, so with her finishing her time on Indian cruises that is where she could go but will have to wait until her ownership is updated and I am not expecting that to be any earlier than when she is withdrawn and could even be two months after that. The last ship bought by an Indian company was the MSC Cruises ' Melody ' ! She was renamed ' Qing ' , is Indian registered, and is now in a pretty poor state at a shipyard in Goa for about six years , with no work being carried out, and partly sunk as shown ! Thanks, Neil, for news on the neoClassica (and Qing). I always thought the Melody was an well- maintained MSC ship that had possibilities for Value cruises. I hope the Goa folks will get her up-right and back into some type of sailing situation. I knew I had not heard any information about the ship for sometime. Do you think she will be saved or salvaged ? Now- a- days, people want balconies. From the looks of the ' Qing ' at the shipyard, where there is also an abandonded floating dry dock which is also partly sunk, I do not think she will have a future as with that gunport door open in the picture she will have flooded inside and that will be the finish of her engines and generators. It was reported that it was planned to convert her into a floating hotel but obviously had not been costed out as apart from the ' Queen Mary ' in Los Angleses, which always looses money, and the ' Ming Hau ' ( Pictured Above ) which was completely landlocked at Shenzen in China, after she had been guided into a cutting which was then land locked and filled with concrete with about 18 inches of water on top to give the impression she is still afloat, it does not work ! Alongside the ' Ming Hau ' is a nine hole golf course and a tourist type village called ' Sea World ' ! Picture of the ' Ming Hau ' at night time below and as she was previously when the French passenger cargo ship 'Ancerville ' which was built in 1962 and shown arriving at the spanish Canary Islands port of Las Palmas ! Her convesion work included cutting some big windows in her sides but she still retains her lifeboats.There is about 230 rooms for hire and variouis other guest facilities including a micro brewary ! or a nearby port, after her Indian cruises ! .